Back in the '80s, the chart would take an extended break over Christmas, with as long as three weeks passing without a new top 50 being issued. This wasn't unusual - the Billboard charts routinely had a repeat week in which the charts didn't change over the holiday period. 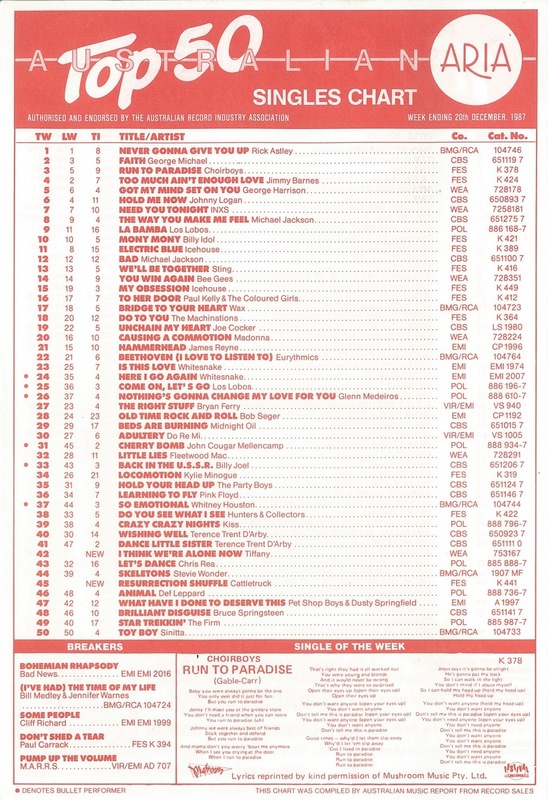 So this week in 1987, the final Australian chart for the year was printed. Don't get too excited, though - it was a pretty dull week. Australia hasn't ever really had a race for the Christmas number 1 spot in the way the UK has, with singles chart activity petering out throughout December rather than spiking to a frenzy. 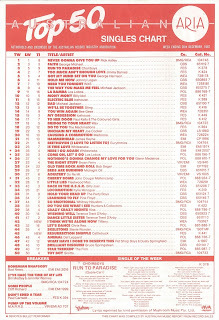 Twenty five years ago, there were only two new entries in the top 50 (both of them remakes), but the week was notable for the appearance of the year's worst single (also a cover version) as a breaker. Things were so quiet that the weeks-old "Run To Paradise" was featured as the Single Of The Week. I guess that might have been useful for anyone still wondering exactly what the lyrics were. At number 1, there was no change as "Never Gonna Give You Up" by Rick Astley stayed on top for a third week. Newcastle band The Heroes were big in their home city but couldn't translate that into national success with this independently released single. Released to support compilation album The Slim Dusty Heritage album, this became the country legend's latest single to miss the top 50. He'd be back there for one final time in 1988. Hailing from the much less exotic Adelaide, this rock band entered the top 100 for the first (and only) time with this second single from debut album Cafe Istanbul. I've never understood the appeal of novelty singles. Sure, the music videos that accompany them can be amusing, but when it comes to the single itself, why would I want to listen to a joke instead of a song? Apart from European singles which are unintentionally funny, the main source of comedy releases is the UK. We'd already seen "Star Trekkin'" by The Firm invade our top 10 earlier in 1987, but been spared Spitting Image's "The Chicken Song" from 1986 taking off here. Bad News was a Spinal Tap-style spoof band consisting of most of The Young Ones (who themselves had a massively successful comedy record in 1986: "Living Doll" with Cliff Richard). The "band" had been around since 1983 as part of The Comic Strip Presents... and, in 1987, released an album produced by Brian May from Queen (is there nothing he won't do?). When I started this blog, I did not think I'd be talking about Cattletruck quite as often as I have these past few months. In fact, I had completely forgotten about the Aussie rock band altogether. Unfortunately for them, they never really made that big an impact on the chart, with this fourth and final single (a remake of the Ashton, Gardner & Dyke number 16 hit from 1971) proving to be their biggest success. At the time, I much preferred earlier single "Leave Me" and couldn't get into the Georgia Satellites-style blues/rock sound of "Resurrection Shuffle". Nothing's changed on that front. 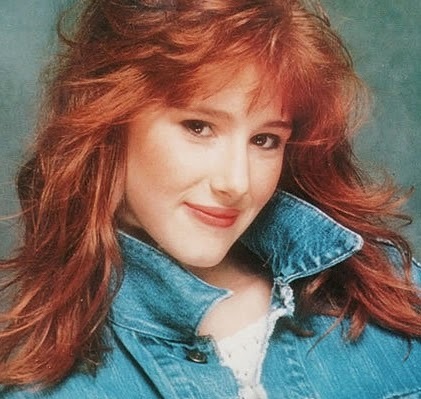 Already a massive success Stateside, teen singer and future schlock horror actress Tiffany finally debuted in Australia with her US and UK chart-topping cover of the Tommy James & The Shondells track (which also made my personal countdown for 1987, where I talked about it in more detail). It wouldn't scale quite the same heights here, but it proved to be quite persistent, sticking around on the top 100 for 35 weeks. Not bad for a song that Tiffany herself wasn't that keen on recording and one that received little support from her record company, prompting her manager to wheel her out around the shopping malls of America to generate interest. Next time: the next top 50 chart was issued for the three weeks ending January 10, so we'll pick things back up then. In the meantime, I'll be counting down my favourite songs for 2012 and revisiting some more 1980s acts I haven't yet talked about in my personal yearly charts.